Author(s): Marcelo V. Osorio, Salette Reis, Jose L.F.C. Lima, Marcela A. Segundo. UCIBIO, REQUIMTE, Department of Chemistry, Faculty of Pharmacy, University of Porto, Rua de Jorge Viterbo Ferreira, 228, 4050-313 Porto, Portugal. Background: Diclofenac (DCF), an arylacetic acid non-steroidal anti-inflammatory drug (NSAID), is among the most studied pharmaceutical compounds in the aquatic environment. 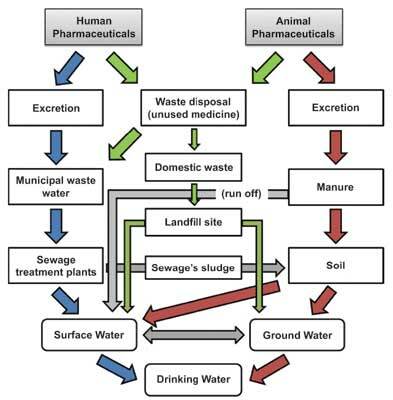 Materials and Methods: In order to assess the relevance of diclofenac as index compound for the presence of pharmaceuticals, the occurrence of DCF in natural and wastewaters was assessed from literature reports (1998-2012, n = 162), along with the analytical methods employed for its detection and quantification. The detection of DCF was more frequent in wastewaters, where it was present in > 83% of samples analyzed, compared to natural waters (c.a. 46%). The presence of other pharmaceutical compounds belonging to different therapeutic groups was observed for most samples where DCF was found. Five groups of pharmaceuticals were detected in more than 80% of samples containing DCF: analgesics, antidiabetics, antihypertensive drugs, CNS stimulants and NSAIDs. In addition, among the pharmaceutical compounds that appeared most frequently were other NSAIDs such as ibuprofen, naproxen and ketoprofen, the psychiatric drug carbamazepine, lipid regulators, such as clofibric acid and gemfibrozil, and the antibiotics sulfamethoxazole and trimethoprim. Conclusion: Regarding the analytical methods applied for DCF determination in environmental waters, LC-MS and GC-MS were the most frequently applied, with a frequency of 51% and 30% of the evaluated reports, respectively. Sample treatment prior to quantitative analysis was essential, performed mainly by SPE (86.5% of the reports), followed by SPME (2.9%) and LLE (2.9%). The frequency of detection and the concomitant presence of other pharmaceuticals make DCF a suitable marker for anthropogenic pollution. Keywords: Diclofenac, pharmaceuticals, LC/MS-MS, environmental pollution, aquatic environment, wastewater. Affiliation:UCIBIO, REQUIMTE, Department of Chemistry, Faculty of Pharmacy, University of Porto, Rua de Jorge Viterbo Ferreira, 228, 4050-313 Porto, Portugal. Keywords:Diclofenac, pharmaceuticals, LC/MS-MS, environmental pollution, aquatic environment, wastewater.